The ImageStream®X Mark II Imaging Flow Cytometer combines the speed, sensitivity, and phenotyping abilities of flow cytometry with the detailed imagery and functional insights of microscopy. This unique combination enables a broad range of applications that would be impossible using either technique alone. 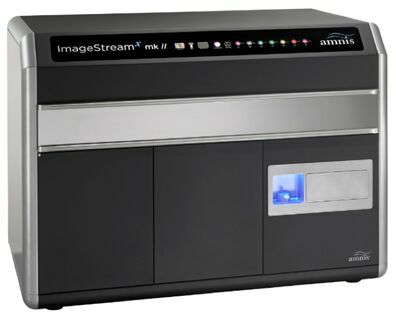 Flow cytometry and Microscopy taken together, the capabilities of the ImageStream®X Mark II makes it superior from traditional flow cytometer while transforming the scope of flow cytometry. The ImageStream®X Mark II system delivers multiple high resolution images of every cell in flow, including brightfield, darkfield (SSC) and up to 10 fluorescent markers at high speed. The ImageStream®X camera operates with a pixel size of 0.1/0.25/1 μm2 with 60X/40X/20X magnification, respectively, allowing visualization of fluorescence location from the membrane, cytoplasm, sub-cellular organelles or nucleus at high resolution. Instrument is supported by Powerful Post-Acquisition Image Processing Software IDEAS®, allowing quantitative determination of location and strength of fluorescence signals and helps integrate the Image Data with Plots and Statistics. It also provides more than 80 Features which helps to determine Size, Shape, Texture, Co-localizations & Intensity of fluorescent signal from each cell. IDEAS® Software combines image analysis, statistical rigor, and visual confirmation in an easy-to-use package. High Resolution: MultiMag option provides 60X and 20X objectives,in addition to the standard 40X objective. High Throughput: Analyzes thousands of cell/sec at upto 60x Magnification. Autosampler: Enhances productivity with unattended sample loading from 96 well plates. Extended Depth of Field: project all structures within the cell into one crisp plane of focus. Excitation: 488 nm, High Power 488nm, 375 nm, 405 nm, 561 nm, 592 nm, 642nm and 730 nm, Side Scatter, Brightfield. Magnification: Standard 40x Objective, with Optional Upgrade to Multimag with 60x & 20x Objectives. To become the top Life Science Company with a wide range of products for every life sciences researcher in India.